My name is Jane Mitchell, and I am a junior at Hofstra University pursuing a B.S. in Health Science with minors in Neuroscience and Biochemistry. I plan to apply to medical school, however before I embark on that endeavor I want to get experience in hospital research. Hofstra University’s advising office sent me an application for the North Shore Emergency Department Research Internship Program. After an interview process and careful consideration, I was granted a position in the program. 100 hours later, I gained a greater understanding of how to design, conduct, and analyze research. I have been a part of organizing educational conferences for doctors on staff, conducting satisfaction surveys with current patients, and analyzing data. I have learned a great deal while working with great people within the North Shore - LIJ Health System, and I feel more comfortable working with doctors and other personnel within a hospital now. My favorite project that I worked on was the Breath-ED project in the emergency department at Cohen’s Children’s Medical Center, which is an initiative to improve asthma treatment plans for children. I hope to one day work in pediatrics and so this was the perfect project for me. I was able to meet the children for the study when they were in the Emergency Department for their initial treatment, after which I would follow up with them through surveys conducted via telephone. I was pleasantly surprised at how responsive the children and their parents were. 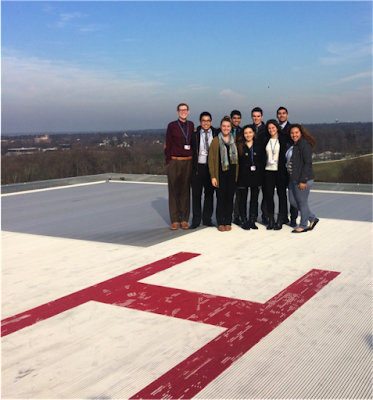 This internship included Educational Days, where for example one day we met the Director of Sky Health and he took us up to the helipad (pictured)! This was an incredible way to spend my semester and I look forward to seeing what other opportunities Hofstra sends my way!